Today I want to celebrate mothers everywhere. As my son would say, "It's momma's day!" I want to celebrate the mommas that have many children and those who have few. Those who have alive children and those with angel children. And I want to celebrate those women with a strong momma heart but for one reason or another do not have children. Your momma heart deserves celebration. You are all beautiful and beloved. You are growing the next generation of leaders, teachers, friends and of course the next generation of mommas (and daddies!). Even if you have no children of your own, you are helping to cultivate the generations with your momma heart. For that we are forever blessed and thankful. Thank you for your giving and patience, thank you for your sweat and tears, thank you for your deep love and your correction. Today I want to take a moment to honor and celebrate Ashley's and my momma, Deb. Our mom has a strong but tender momma heart that has taught Ashley and me so many things--about God, about ourselves, about how to love others and ourselves, about how to be strong women in our spheres of influence, and also about how to be mommas. Thank you mom for passing on your momma heart to us. There's one more thing I want to celebrate our mom for today and share with you. I want to share with you something that our mother shared with us... a love for nourishing food and skills required to prepare it. Our mom was always just "throwing things" together to form a dish that did not come from a recipe. I so fondly remember saying, "Mom, this soup was delicious. What was in it?" She would often reply, "I don't know, I just threw things in!" Initially when I began cooking, this spontaneity and lack of structure drove me nuts! I didn't have the experience or passion to just whip things up myself. I'm getting better at that, but I still love having recipes to fall back on where I know exactly what and how much to put in. One "recipe" (I say that lightly) that our mom frequently made and that always tasted delicious was roasted chicken. Our mom would prepare a whole chicken in the oven with several tasty vegetables, and before it even got to the table, Ashley and I were digging in with our forks to get the juiciest bites. 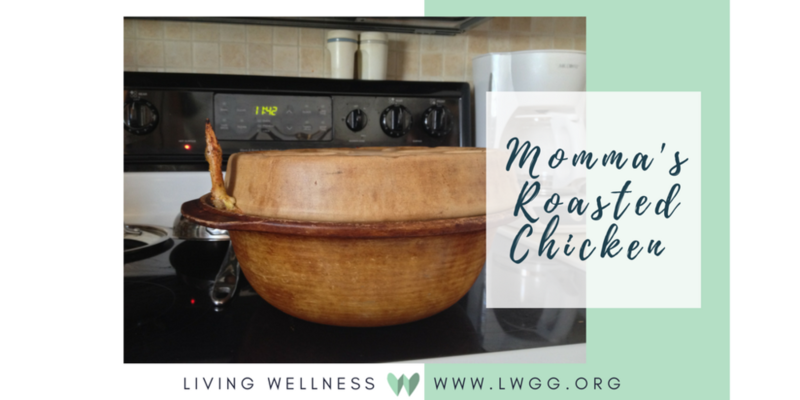 Our mom would always prepare the chicken in a covered Pampered Chef stoneware dutch oven that we dubbed "the chicken pot." One day she was making roasted chicken in the oven and asked me to check on it. I opened the door of the oven and burst into tears...tears of laughter followed by shrieks of laughter. She came running into the kitchen unsure if I was laughing or sobbing. She asked me what's wrong and between gasps of laughter I gesture for her to open the oven. I can't quite remember her reaction, but it ended up being similar to mine. We still are unsure how the chicken wing got our of the chicken pot, but we prefer to think the chicken was trying to make a break out of the chicken pot. In more recent years, I am now making my own roasted chicken and was finally able collaborate with my mom to write out a recipe. Here is a collaborative effort between the two of us for, in our opinion, the best roasted chicken. Wash and cut parsley, celery, and carrots. Peel onion, cut in half. Peel garlic (pro tip: lay garlic clove on cutting board. Place your knife horizontal on top of the clove and press down. This will make peeling and chopping much easier). Wash thyme. Set all of these aside. Melt butter in small sauce pan over medium-low heat. Remove chicken from packaging and place upside down inside large Dutch oven or other covered oven-safe dish. Pat dry whole chicken with paper towel to allow for seasoning and butter to adhere to skin. Pour half of the butter over underside of the chicken and follow that with half of the all-purpose seasoning, salt, and turmeric. Turn chicken over and pour remaining butter over the top and if possible drizzle butter between the skin and meat of the chicken. Sprinkle remaining all-purpose seasoning, salt, and turmeric over the top of the chicken. Carefully slide 3-4 cloves of garlic under the skin. Place remaining garlic cloves inside chicken cavity as well as half the onion and 4 springs of thyme. Place remaining onion, thyme and all the carrots and celery around the chicken. Cover chicken and cook in oven for 45 min to 1 hour. Then reduce heat to 300 degrees and cook for another 45 min to 1 hour until internal temperature reads 165 degrees. I would love it if you would leave a comment below letting me know how this recipe turned out for you! Please also comment what recipes you'd love to see in the future. You are worth more than mediocre. You are worth exceptional health! © 2017 Living Wellness, LLC Revolutionizing health, one community at a time.